The XPress Pro created a whole new category of Home Gyms. It was the very first gym to ever incorporate our Adjustable Cable Arms. This revolutionary feature opened up literally hundreds of new exercises available on home gyms, from Dumbell Training, to Functional Training, to Core Training, to Sports Specific and Rehabilitation exercises. 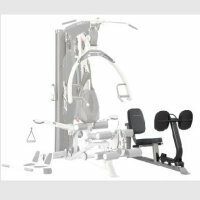 This feature has been copied by virtually every home gym supplier in the business, and has come to be recognized as a sub-category. The XPress Pro is the standard; copied, but not duplicated! 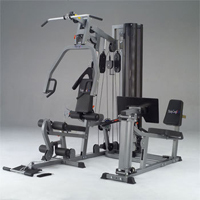 Bodycraft XPress Pro Home Gym is a leading Home Gym in the fitness industry. Shape your body, get strong, lose weight, and even improve your golf swing with the BodyCraft XPress Pro strength training system. The XPress Pro lets you perform a wide range of exercises, with stations for chest presses, shoulder presses, lat pulls, leg lifts, and more. The XPress Pro starts with a row/press arm that supports safe, machine-style bench presses, incline presses, shoulder presses, and seated rows. The leg extension/leg curl station, meanwhile, offers a convenient self-aligning feature that accommodates virtually any user. Add in the functional training/cable arms--which support more than 100 exercises--and you have a terrific gym for functional core training, sports-specific workouts, and rehabilitation exercises. Users will also appreciate the XPress Pro's series of pulleys, which includes a mid pulley for ab crunches and tricep extensions, a high pulley for lat pulldowns and tricep pushdowns, and a low pulley with a foot plate for low rows, leg and hip exercises, arm curls, upright rows, and more. The XPress Pro uses these pulleys and cables to deliver unrestricted, completely natural, biomechanically correct movements. You define the path, providing for a greater, more natural range of motion that incorporates the use of stabilizer and core muscle groups, an advantage not found on typical home gyms. Finally, the XPress Pro includes a 200-pound weight stack that can be doubled to 400 pounds when combined with the leg press, which is cabled at a 1:2 ratio. Construction features include 12-gauge steel tubing; flexible, nylon-coated aircraft cable rated at more than 2,000-pounds tensile strength; 4.5-inch-diameter, fiberglass-impregnated nylon pulleys with sealed ball bearings; 2-inch-thick high-density foam covered with double-stitched vinyl; chrome-plated 1-inch tubular steel guide rods; noise-dampening, perforated steel weight stack guards; and a platinum gray, powder-coated finish. 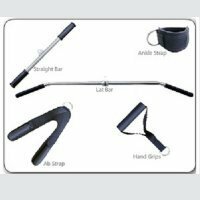 The XPress Pro measures 56.5 by 83 by 82.9 inches (W x H x D) and comes with a lat pull bar, curl bar, ankle strap, and two single handles. It's also backed by a lifetime warranty. Since it is built to last a lifetime, every part of the BodyCraft Galena Pro is guaranteed for as long as you own it. We will replace or repair any defect. Warranty applies only to the original owner and for in-home use.